Look whose work got picked up by the BBC! I check the BBC’s Nature News every morning. 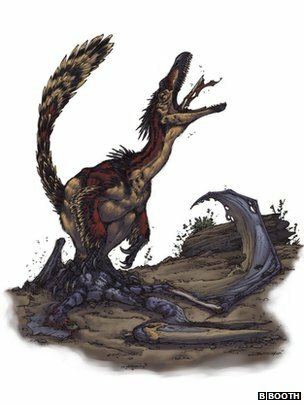 Boy, was I pleased to see this image in an article about a discovery that a Velociraptor’s last meal was a pterosaur! Oh yeah. “B. Booth” is Brett Booth, who is Jess Ruffner’s huband. Jess Ruffner is the author of the fomer blog called DesertWindHounds and.the new and improved blog, DesertWindHounds: A Bitter CynoAnarchist Rages On. Ms. Ruffner has been known to comment on this blog on occasion. Brett drew the image, and Jess did the coloring. They were hoping it got picked up by Fox News, but they did much better this time. The BBC creams Fox News in every way!